I can’t get enough of these second-generation Rambler Americans, they’re so quirky and gangly and.. hey wait, I just described myself. 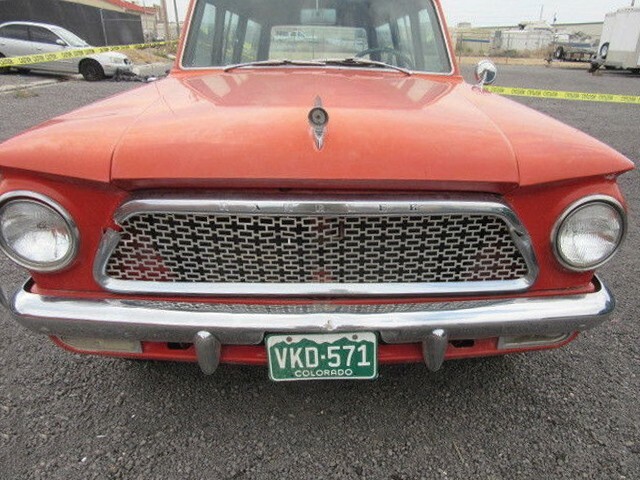 This 1961 Rambler American wagon is listed on eBay Pueblo, Colorado and there is no reserve. The current bid price as I write this is $1,903. Thanks to our friend, Ikey H., for sending in this great Barn Find tip! As is often the case these days, the photos aren’t the best and a lot of them are cut off or partial images. But, after looking at those cut-off and partial images this car looks great. 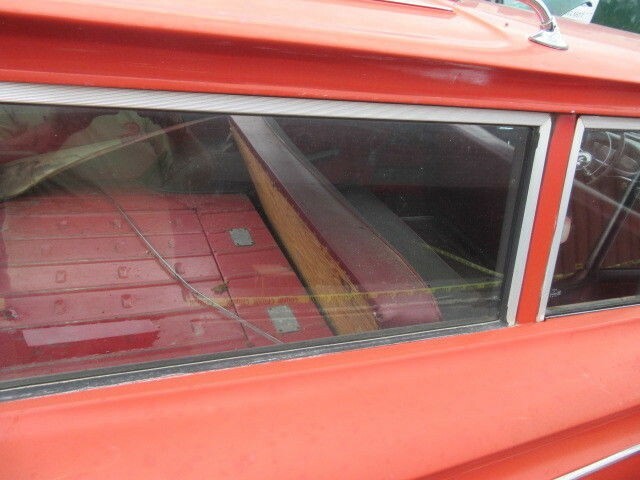 The seller says that this is a “True Barn Find…. Straight out of estate to this listing. This is a ONE Owner….approx. 30k original miles. Vehicle was parked in garage by estate owner’s Grandfather in 1990 and has sat there since.” I like it even more now. 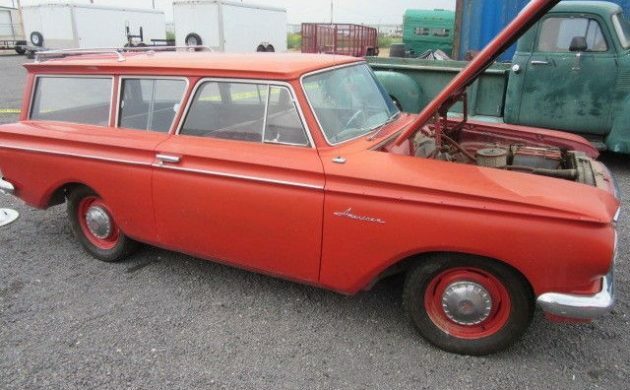 A two-door wagon gets me every time and a second-generation Rambler American is already my favorite Rambler American, a wagon just adds to the quirky cool factor. This has sleeper written all over it to me but I’d love to have it just as it is here, maybe just maintain it, update the rubber parts and wear items and drive it. I would want to find an OEM replacement air cleaner or a junk yard equivalent. 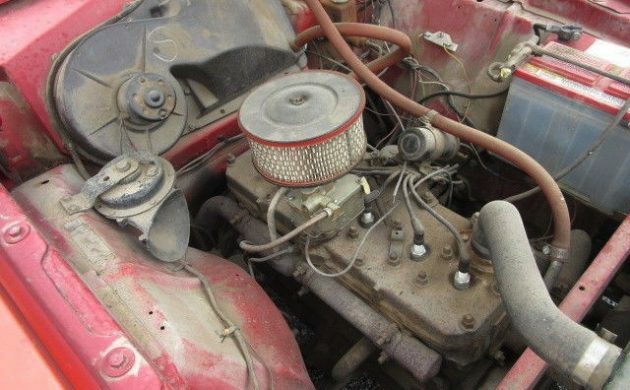 This 195.6 cubic-inch flathead-six isn’t currently running even though it looks like it should fire right up. The seller says that they “do NOT have a key. Engine moves and appears quite clean. 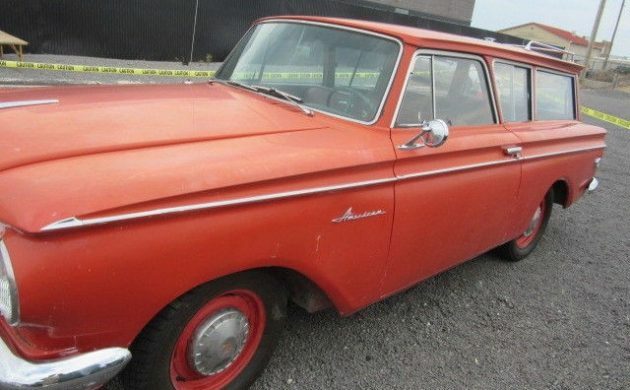 It is NOT frozen and I think with some minor effort will run.” I absolutely love this car, I hope that there are a few other second-generation Rambler American fans out there? Perhaps he means “sleeper” with the fold down front seats, if so equipped. Hey, it’s in my back yard,,kind of (75 miles, closest big city.) This a great find, as in the late ’60’s, there was no reason to keep a car like this on the lot. These were back lot, $100 beaters, and the next stop was the junkyard. Personally, I love it, and probably would have bought this before the ’77 GMC pickup( except, the pickup was $500 less and was turnkey) I have a good friend that always wanted a vintage Rambler, finally got to test drive one, a ’61 Classic, if I remember, and was disappointed at how it drove, even though, there was nothing wrong with it, so you might want to be ready for that. This was a pretty basic automobile, and a very low power ride and we’ve come a long way since. Great find. If you’re accustomed to driving more modern vehicles you will most likely be disappointed in the way a 1950s or early 1960s Rambler drives. 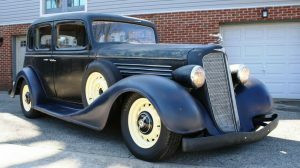 For the vast majority of them we’re talking truck-slow manual steering, anemic six cylinder engine of 1930s design, and no real handling in the current sense of the word. (In those days “handling” usually meant “parking ease.”) If you were lucky and got one with V8, heavy-duty suspension, and power steering then it would be a different experience. In particular this car is going to drive like a 1950 Nash, because that’s what it really is. (I’ve owned Americans of this vintage. They were meant to be economical transport and not much else.) However if you get into the right mindset it’s still a fun ride. These 2-door wagons have a wonderfully bizarre look and it’s pretty much guaranteed that there won’t be another one wherever you go. 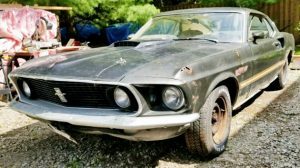 I had a ’63 sedan, flathead, 3-speed, no options. HORRIBLE to drive, and I loved every minute of it. I’m in Colorado, this is the last thing I need right now, no place to put it, no ability to work on cars, and I want it. Two door station wagons are great. If I lived in the area I’d definitely be looking into purchasing this car. I hope the lack of paperwork can be resolved without too many headaches. Thanks for featuring this car. I love it! All she needs is a good, thorough cleaning inside & out, clean up the engine and ENJOY the heck out of her. She will return that love with years of solid reliability. For some reason I like it? Ya, I’m up in Denver – tempting…. That little flathead will run. Just clean the carb out. But it needs more than that. I guarantee that if it has been sitting since 1990, it will need serious brake work and a new fuel system too. But we all know this is a project. What a cool car. My future and present Wife’s Mother had a 1961 convertible, white over red, flathead with auto. Two other options were an am radio and full wheel covers. We drove it on a 3 hour trip in the middle of Winter on two lane roads. Lack of power and the vacuum wipers made passing an adventure. Any attempt at accelleration produced noise and stopped wipers. I’d take one today. These cars weren’t exactly beautiful, but there’s something likable about them. Man this thing looks great! I know the ride can’t be to good but I am sure it rides better than my old Willys wagon. Looks like three pedals also. Oil bath air cleaner? Great find! So damn homely that they are cute. Looks pretty solid and I’d love the novelty of owning it. 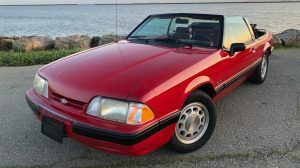 I have owned a number of them back in the day including a convertible. Drag-raced one but it had the OHV 6-banger(7 main-bearing crank) and would really run. If it was closer, I’d own it for 2 grand. Believe it or not that is the air cleaner they came with from 1958 thru 1961. Oh, man… used to ride to Huntsville Alabama from Jacksonville State in a sedan version, guy wouldn’t do over 35mph. Trip was ENDLESS. His had the ‘voobamatic’ transmission, 9-turn lock-to-lock steering and cardboard brakes. This one looks good, and now that Mopar and Ford offer crate motors from Hellcat to Ecoboost 4s there could be some serious subterfuge goin’ on. My ‘61 had a large round black oil bath air cleaner on a straight six engine. Even if not year correct, should be an easy find at an American Motors wrecker. And those vacuum powered windshield wipers proved to be real exciting while driving uphill on a rainy day! Love it! It would look great parked next to my ’61 Rambler American Custom 400 4 door.sedan. Sure wish it was closer to home. Someone is going to get a neat little wagon. I would clean it up, get a new rubber floor mat and enjoy the heck out of it. 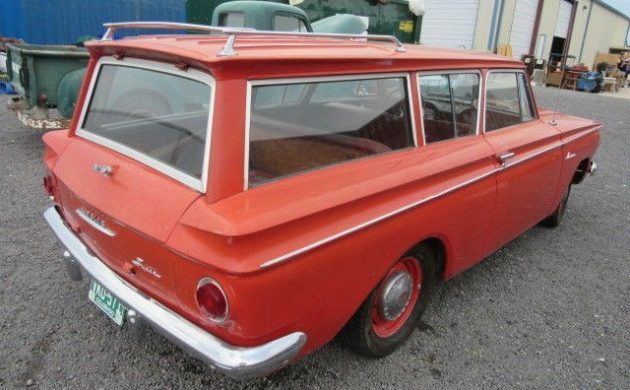 Really neat wagon, but no paperwork? If the PO got it in the estate, then he should have gone to the trouble for some paperwork. It’s just another example of a lazy flipper wanting money for nothing. I love working on old cars, but I hate dealing with the state trying to get some legal papers on them if they came without. I have passed on many wonderful cars because of this issue. Wow! What a find! When I think of fishin’ cars this is what I picture. As you guys know, I drove a ’62 American wagon in high school. It makes me appreciate my base-model EuroFord Sierra longroof that much more. Scotty, that IS the OEM air filter..! This one would be a good entry-level collectable, however. I wonder what it would take to put a Mustang IFS on this. Then for some reason I’m thinking of a donor BRZ boxer motor under the hood. Or a honda. Maybe an I4 would clear things better. Looks to tight for a boxer. Like a crazy man. I bid on it… buyers remorse. Primitive driving experience aside, this one would be fun. This wagon is beyond cool to me! It’s beyond awesome as far as I am cancerned! Wished it were mine! Ever drive something with the 195 engine? Barely adequate in the ’60’s, that Acura( and line of SUV’s and monster trucks) will be riding your tail for miles. This website needs to set standards. No title no publishing on the website. So what ? Let them ride your tail. Do I go out in my old car to cater to the speed-racer set ? Or do I go to enjoy my own ride in my own space ? I choose the latter and really don’t give two rips who is riding my tail, so they can go on speeding down the road. Let that be THEIR challenge and fun to get around me. Frankly, I get enough of the speed demon world in my work and other things. My old cars are my “escape”. I will not give that one away to the go-ever-faster world. IMHO Straight axle gasser with an Amc V8 AND 4 speed!!! I think the only option the original owner ( estate’s grandfather) ordered was undercoating. The optional OIL FILTER was not even ordered!! I’m going to add the dealer aftermarket version. Just cleaning so far and a couple new lenses,gas filler tube. Needs all door seals and a RH spear tip (anyone?) Will be a long term project, but after the initial WTH from the wife, she’s onboard. Will post some road pics when she’s out there. Congratulations, Andy! We’ll look for those pictures soon! I used to think a car without an oil filter was outrageously stupid. Then I discovered pre-war cars and came to understand MANY never had them. People looked at the issue differently …. and CHANGED the oil, or drained it, ran it through a filter, and then poured it back in. Motor vehicles were to be tinkered with. Remember, most people then had previously owned a horse, and tinkering on a car was a lot less fuss than taking care of a horse or ten. So, people did not think much of it. I grew up in the sixties and there were a LOT of people still alive then that grew up in a steam era America. None of my 20’s era cars have oil filters. Not a problem. Just drain and filter. When it gets pretty dark, recycle it and pour in a whole new batch. If you stay on top of your car’s “pulse”, you really don’t need an oil filter. Personally, I’d leave it without. This car is a time capsule of the last remnants of 19th century thinking. Just another “asset” of a cool stripper car. Glad to hear the car found a caring home. Had on when i was in High School. Not much of a car to catch the girls but it does have some memories. It was a three on the tree with overdrive. I used to call it my four speed. yuk yuk. 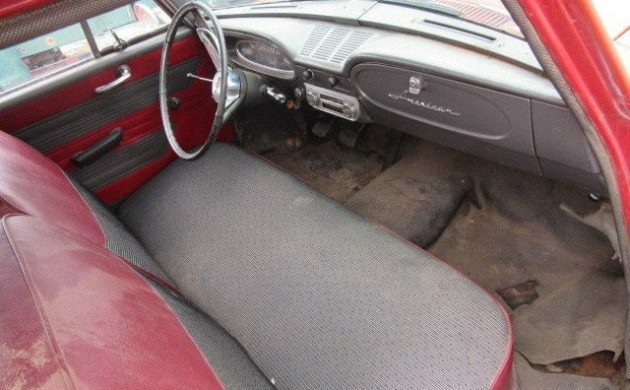 It did have the fold down seats that Rambler was known for..I traded it for a 1965 Rambler 770 convertible with a 327. That brought more attention.. Lots of fun. To me this is a very ugly vehicle with sterile, Eastern European Communist-era styling. I can hardly look at it. What this car IS, is DIFFERENT. It’s not another #@! 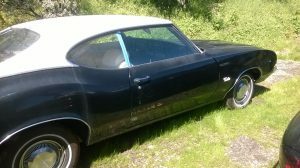 Chevelle, Nova, Mustang, etc. Toady as it is, it is cute and charming, like a pug dog.